Seated Liberty Quarter coins were issued for a period of 53 years, representing the longest design duration for the denomination up to that point. 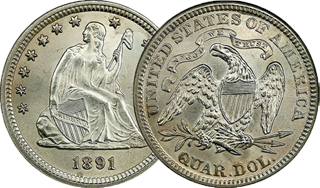 Mintage figures varied from the low thousands to over 10 million. Seated Liberty Quarter coins were struck at Philadelphia, New Orleans, San Francisco and Carson City.